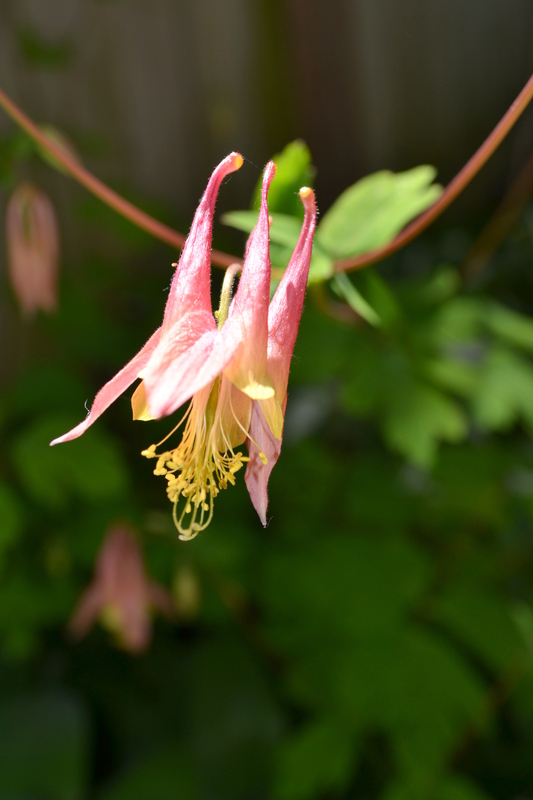 Columbine in bloom in my garden. There are other shapes and colors of this common flower that are available, so I may get some more of these. Well, blog fans, a tree dispute is underway. When my wife acquired some spruce trees form the Arbor Day Foundation last fall, I planted one in our backyard. And she doesn’t like it, not there, probably not anywhere. She has a point because the tree will have many points. She says, although this I don’t agree with this, that I planted it “in the middle” of the play area of the yard. 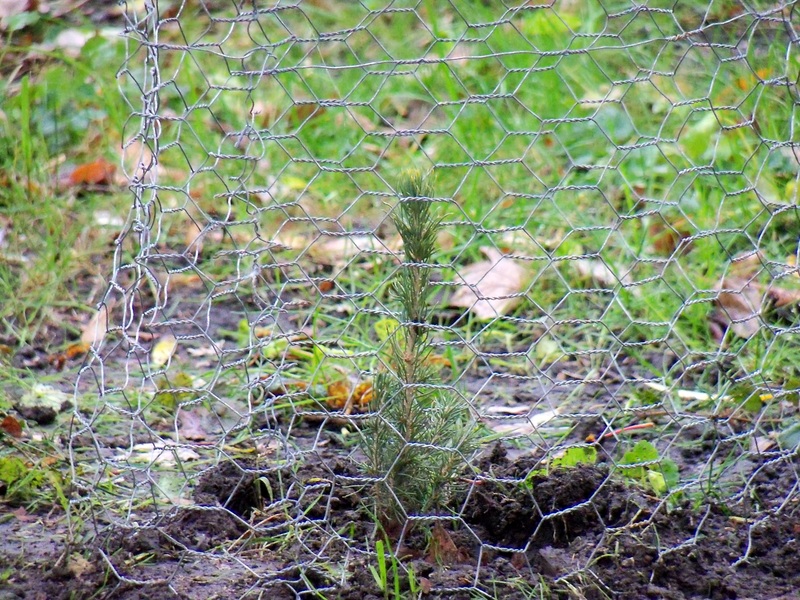 Given that a spruce needs space, I did plant it out from the fringe of trees that surround the play area, but no, it’s off to the side, not in the middle. Still, again, I can’t dispute the reality that the tree would certainly truncate the play area with its prickly trunk and branches. The fate of the spruce remains to be seen. It’s her yard, too. If I cannot persuade her that the tree belongs where it is, then yes, I won’t fuss too much when it’s taken out (I might even be the taker outer, although I don’t really want to be). Stay tuned. Anyway, as this odd year seems to be starting June growth in April, I’m making some garden plans. Before plants are bought or borders placed, yes, I’ll make sure the wife is on board. 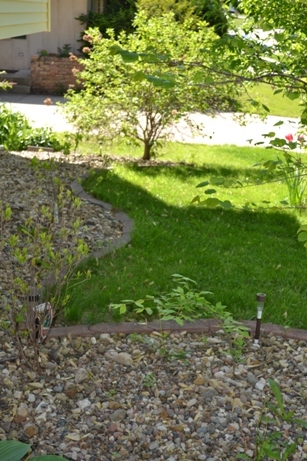 There is an oddly shaped garden border in front with a sort of “fold” in it that creates an area that is hard to mow. The area is shady, it’s on the north side of the house, but if we placed a garden border straight across between two outcrops of the house’s landscaping border, we would create a new strip where a shade garden could go. It would have to be a fairly “short” garden since I would not want to obscure the basement windows, a point to keep in mind later if you’re moved to make suggestions. Similarly, in back there is an area near the chimney where intense lilac shade, aided in recent years by tree growth, has all but eliminated grass. We planed bulbs there, and will border that corner off. Jack in the Pulpit. According to some of my plant catalogs, these do well where ferns and hosta do well, and both of the sites I’m contemplating seem like hosta homes. Jack in the Pulpit seem to have fairly long bloom times, although that may be because several varieties are available in the catalogs, too. I like these flowers, but they seem expensive. Audrey notes she saw then wild in the woods as a youth, although I’m not sure I’ve noted one before. Anybody familiar with these? Arum Italicum. Cream flowers, bright berries. Don’t have any of these yet. Toad lilies. These have long been on my garden wish list, and having some new places makes it a good time to toad it up. Brilliance Autumn Fern. I have not included hostas or ferns, otherwise, on the list just because I have a plethora of those plants. But this reddish fern looks different. 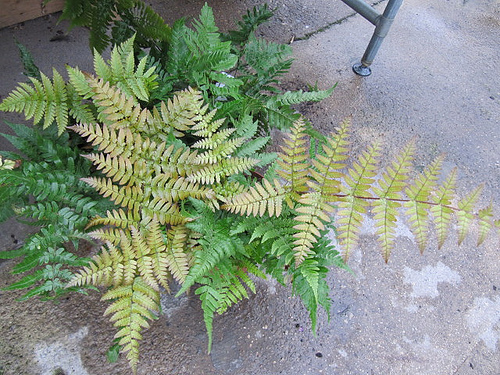 And a “red fern,” for family reasons, would make me think of a recently departed brother-in-law. 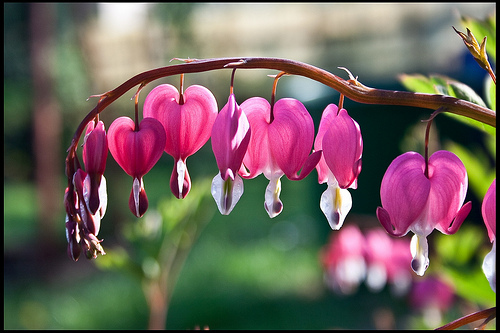 Bleeding Heart and/or Burning Heart. I have a few, but not many, and could use more. Lily of the Valley. Yes, I know, I already have plenty. I’m thinking of paying the high price and getting a few pink ones, which I don’t have. Some obvious choices I may pass up. I like foxglove, for instance, but so do bunnies, apparently. I might mix in a few Columbine, even though I already have a fair number of those, just because there is a wide variety of colors available in Columbine. Well, plans are preliminary. What do you think, blog fans? What would go well in our two small shady spots? And how would you sell the charms of a spruce to a reluctant spouse? Photo notes: Most photos are from the photo commons area of Flickr. 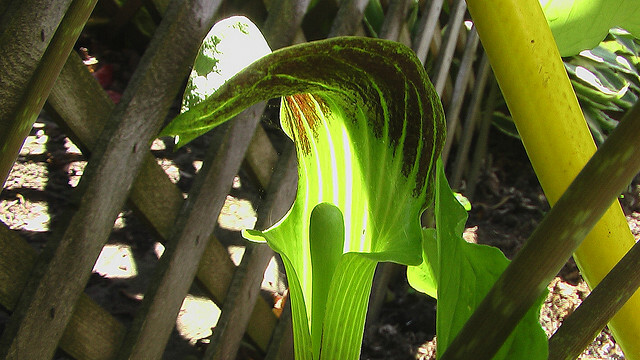 Jack-in-the-pulpit by Simbrian. 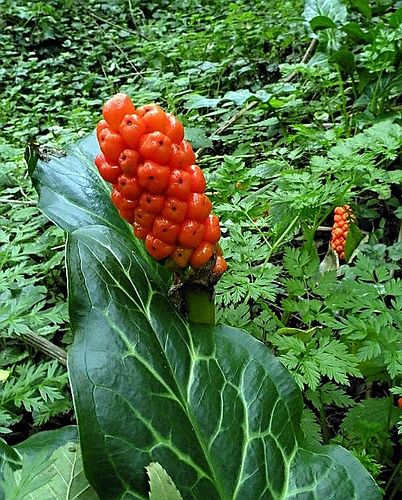 Arum Italicum by jan parie. 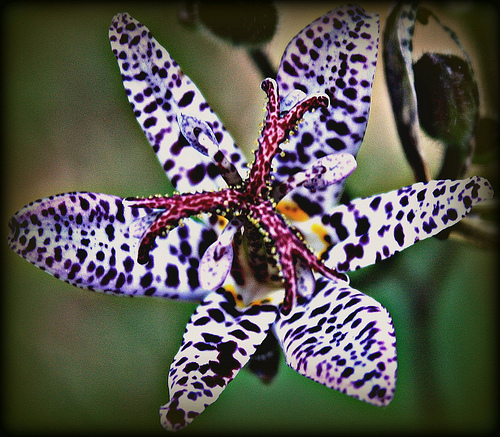 Toad Lily by Weaselmcfee. Brilliance Autumn Fern by wallygrom. Bleeding Heart by analogfetisch. 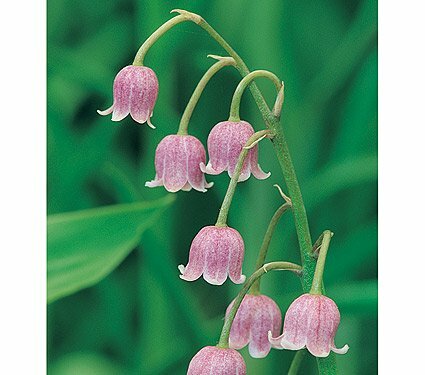 The pink Lily of the Valley is not on Flickr, I got this image from http://www.whiteflowerfarm.com, where the plant is for sale. The opening Columbine photo and the two photos below of the garden plots are, like most images on my blog, photos that I took.